Sports Car Review: Jaguar has not had the smoothest road in recent years. As part of Ford, the division has eradicated the reliability issues that plagued the company’s products in past years. But other facets of being part of the blue oval have been less rosy. The S-Type, while pretty and traditional looking, did not sell in the volume that was planned, and the X-Type, well, that car, based on Ford’s compact Mondeo, never really gained traction in the U.S. Profitability has been elusive. The new XK, introduced in 2007, shows a new, better way. It replaced a ten-year-old model which itself restored some of the smooth style associated with the historic British marque. Available in coupe or convertible form, it is a worthy successor to the iconic XK-E, or E-Type, Jaguar. Just look at that oval grille on the softly rounded front. There’s even the hood bulge of the E-Type, connoting sensuousness and power. The rest of the car, including contemporary lighting and bumpers, reads 21st century, which is a good thing. “Power vents” behind the front wheels are part of the new design scheme of chief designer Ian Callum. Handsome 18-inch “Venus” design wheels support the package. The XK’s interior is refreshingly plush and carefully wrought. The leather seats hold you tight but comfortably. My Emerald Fire test vehicle featured a tasty Caramel interior with genuine Burl Walnut trim. This wood is carefully prepared by Jaguar’s craftspeople in the traditional way. The new model is significantly roomier than its predecessor, so driver and passenger can stretch out a bit more. I especially enjoyed using the intuitive seven-inch central touch screen with its large, colorful control areas. I was surprised to see the seat heater controls on the panel. They had no physical dash buttons, a first in my experience. 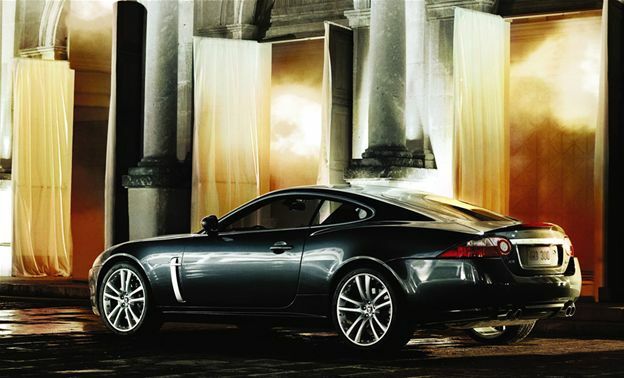 The XK offers thrilling performance with its naturally aspirated 4.2-liter V8. The 300-horsepower all-aluminum engine pushes the 3,700-pound XK from zero to 60 mph in just 5.9 seconds. Jaguar’s engineers have carefully tuned the exhaust system to give the XK the “right” sound, sporty but not too noisy. The V8 engine, with 303 lb.-ft. of torque usable in a wide RPM range, sends power to the rear wheels through a six-speed ZF automatic transmission. You can shift manually using Jaguar Sequential Shift through 2 steering wheel paddles, a first for the XK. Drive-by-wire electronic throttle control adds to the driver’s tactile sense of mastery of the car. The EPA gives the XK ratings of 16 City, 25 Highway. Of course, the real world numbers are always lower and I averaged 14.9 mpg, but the environmental scores aren’t bad. The XK gets a praiseworthy 7 for the Air Pollution score and an average 5 for the Greenhouse Gases score. Despite its two-person, cozy personality, the XK offers significant cargo hauling capacity. Credit its secret hatchback configuration. The entire “trunklid” and window area lifts up and exposes a finely carpeted space with metal and rubber strips ready for your stuff. You lift the hatch the first 20 percent of the way and gas struts do the rest, making it nearly effortless. Naturally, a car like this comes with every luxury and comfort you’d want. Beyond the usual power windows, mirrors, seats, and so on, a satellite navigation system is standard. There’s a no-touch smart key and start system, reverse park control (it beeps out a warning), and a tiny electric emergency brake you flick with your finger. If you want more, Jaguar proudly offers the turbocharged XKR, with 420 horsepower. Turbo boost cuts the zero-to 60 times to just 4.9 seconds. A new Portfolio Coupe model debuts for 2008 with even more goodies, such as 20-inch Cremona wheels, high-performance brakes, a 525-watt audio system, and leather-edged floor mats. At nearly $100,000, the Portfolio Coupe is one very special Jaguar indeed. For the XK Coupe like my tester, the sticker price is $75,550, including shipping. Plan to pay a $6,000 premium for the cloth drop-top model. My tester came with the $3,300 Luxury Package, which includes 16-way power seats with memory (instead of the standard 10-way), upgraded soft leather (nice), a heated steering wheel (don’t laugh), leather shift knob (isn’t this standard? ), power folding mirrors (they fold automatically when you turn off the car), and an upgrade to stunning 19-inch wheels. If you have the cash, the new Jaguar XK gives you a rare combination of luxury and performance in a very nice looking package.